The Junior Recreational Program provides a fun, safe, and developmentally-appropriate soccer environment for 6- to 9-year old players of all ability levels. This 4-year program provides the FUNdamental and Foundational layers of the LTPD model started in our younger programs and introduces another layer of the Gulf Coast Soccer curriculum that helps players grow in their technical skills and knowledge of the game. The Junior Rec Program provides playing options for all U7-U10 players based on their birth year. Once participants outgrow the Junior Rec Program, they will have the option of moving to the Academy Program (up to U10) or continuing to play in the Senior Recreational Program or trying out for one of our higher level Competitive soccer teams at U11 and above. · Key Objectives: Aid the development of gross motor skills, learn basic soccer skills, improve social interaction, and inspire players to love and grow in the game. · Methodology: Fun, soccer-related practice activities develop confidence with the ball and challenge players to experiment with new techniques. Small-sided games reduce coaching interventions and teach players to cooperate with teammates while competing with opponents. · Methodology: Practices focus on skill mastery by using repetition to maximize ball contacts for each player and introduce small-sided tactical concepts. 7v7 games require players to work in units of 2s and 3s to solve a full range of tactical challenges using the skills rehearsed in training. · Practice Frequency: Two (2) per week, 60 minutes each, beginning approximately 1 month before the first game. 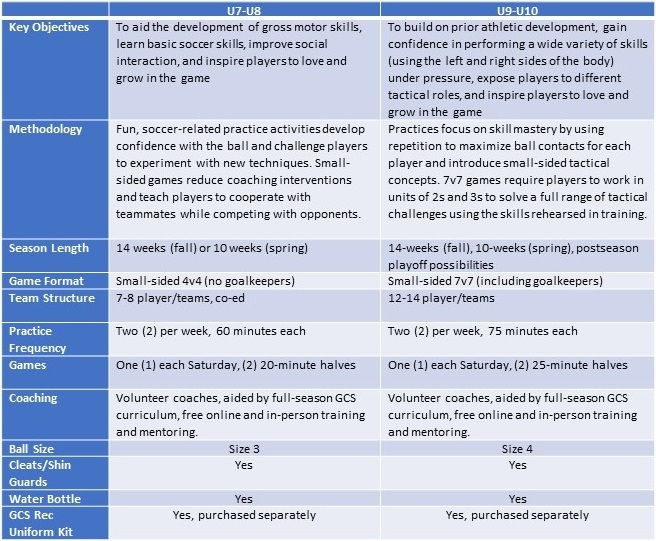 · Coaching: Volunteer coaches receive full-season GCS curriculum, free online and in-person training from US Soccer and mentoring from GCS Technical Director and staff coaches.